The first song Noel performed on The Kraft Summer Music Hall was this wonderful version of God Bless the Child. The song was included on Noel Harrison, Noel's first studio album, but this wonderful live version was performed with much more passion than the recorded version. After he finishes the song, Noel talks to Davidson about his role in The Girl From U.N.C.L.E. television show. After singing God Bless the Child, Noel joined Davidson to perform a number of songs inspired by the British music hall. The first song was Maybe it's Because I'm a Londoner, which was written during the Second World War by Hubert Gregg. 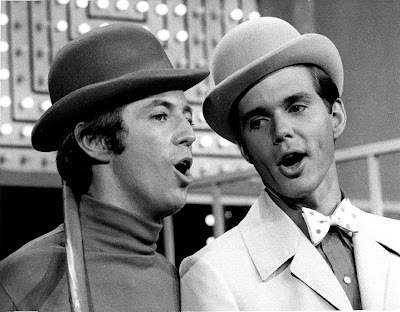 Noel and Davidson are pictured singing together here in a publicity shot from the show. The second song Noel performed in the music hall section of the show was With a Little Bit of Luck, which is taken from the film My Fair Lady, which starred Noel's father, Rex Harrison.